Too much fun in the sun can make you look years, even decades older than your real age. While we all love a sun-kissed, glowing complexion during the summer (and even some of us, despite all the warnings, attempt to keep the glow year round,) in the long run we can end up looking like an old bag! Ever wondered why? Ultraviolet rays are responsible for the break down of collagen fibers – that essential fiber that keeps skin looking young. Lower levels and weak/broken collagen fibers can lead to wrinkles, fine lines and sagging skin. Sun damage can also take the form of sun spots, and discolored patches. When our pigment producing cells, the melanocytes, become damaged by the sun’s powerful rays, they produce pigment irregularly, resulting in age spots and freckles. The combination of these unfortunate issues makes us look older than we need to. But, don’t get too discouraged. There is hope! One of the quickest routes to removing sun damage and revealing younger-looking skin is the Photofacial. Photofacials work in a couple of ways. First, the high energy light waves are absorbed into irregular pigmentation and the pigment is destroyed. Second, the heat producing waves encourage skin cell turnover and increase the rate of collagen production resulting in plumper, fresher, smoother skin. This combination results in a more youthful appearance. But the benefits of photofacials don’t stop there! Photofacials can also treat broken capillaries and rosacea and can decrease the appearance of large pores. And, Photofacials are not just limited to the face. Also called IPL, or Intense Pulsed Light, these treatments can be performed on the chest and hands, or really anywhere that your skin is showing signs of sun damage such as your arms, shoulders, back and even your legs. Am I a Photofacial Candidate? A photofacial is a little bit uncomfortable but only for a short while. During the treatment, an intermittent and tolerable stinging sensation can be felt over the area. A typical treatment takes about 20 – 30 minutes. Once the treatment is over, there is no real discomfort – only a mild sunburn-like feeling that may last for a few hours. For some, there is no down time. For others there can be some swelling that lasts for several days. For your first treatment we recommend timing your appointment so that you can have a few days to recover if necessary. Once you know how your skin reacts, you either won’t have to worry about it – or you will know to always give yourself a few recovery days. After your treatment you may notice right away that the sun spots and irregular pigmentation are darker than before the treatment. And over the next couple of days following the treatment the pigment will probably get even darker and more “peppered” looking. Don’t worry! In about 7 -14 days this pigment will slough off revealing newer, more even-toned skin underneath. During that time you must be extra diligent about protecting your skin from the sun. You may also wear makeup to cover the spots so that no one notices them except for you. Typically it takes around 3 to 4 sessions to see the full results of the treatment. And, your skin will continue to improve for months following the treatment. The collagen will continue to grow over time filling in fine lines, enlarged pores will decrease in size and broken capillaries continue to fade. Discontinue use of topical retinoids, hydroquinone, topical acid products, benzoyl peroxide, clairsonic brushes or other scrub products on the treatment area one week prior to your appointment. Discontinue use of photosensitizing medications one week prior to your appointment. Do not expose the treatment area to the sun for at least 1 week prior to your treatment. Make sure you are not tan or sunburned. Discontinue use of self-tanners 7 – 10 days prior to your appointment. Who May Not Have Photofacial Treatments? HOW LONG WILL THE PROCEDURE TAKE? This depends on the area you wish to have treated and which treatment modality we decide is best for your particular concerns. In general it takes approximately 20 – 30 minutes to treat your face. Larger areas like the chest take a bit longer. Small areas like the hands only take 5 – 10 minutes. WHAT SHOULD I DO AFTER MY TREATMENT? This depends on your reaction to the treatment. If you do not experience swelling, you may return to work or your normal daily activities. Avoid strenuous exercise, hot showers or saunas, and hot yoga for the first 3 – 5 days. Avoid the sun for the first week and then make sure to apply a high-quality sunscreen with at least 8% zinc oxide or titanium dioxide every hour that you are in the sun after the first week.If you do experience significant swelling, we recommend that you follow the above instructions but also make sure to rest, apply ice packs and take an anti-histamine like Zyrtec during the day and Benadryl at night. When resting or sleeping, make sure your head is elevated above your heart. This will help drain any swelling. Application of over-the-counter hydrocortisone cream can help reduce your reaction as well. WHAT WILL MY SKIN LOOK LIKE AFTER THE TREATMENT? Within several minutes of the treatment, the treated area may become slightly red and sometimes raised. Some experience a sensation similar to mild sunburn. This reaction subsides within a few hours. 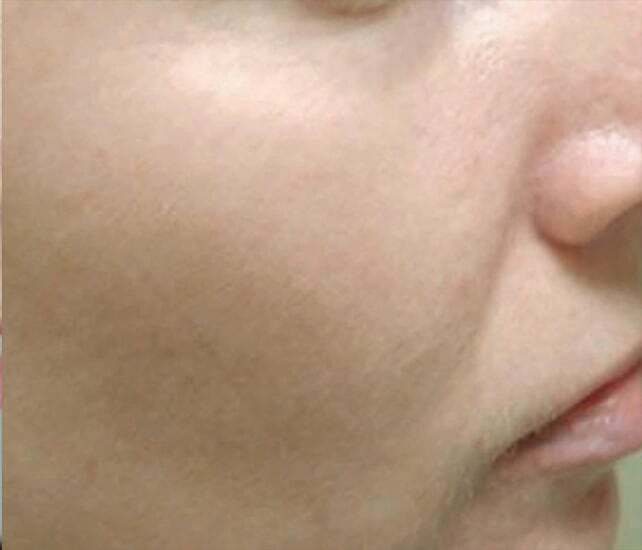 Approximately half of patients experience swelling. 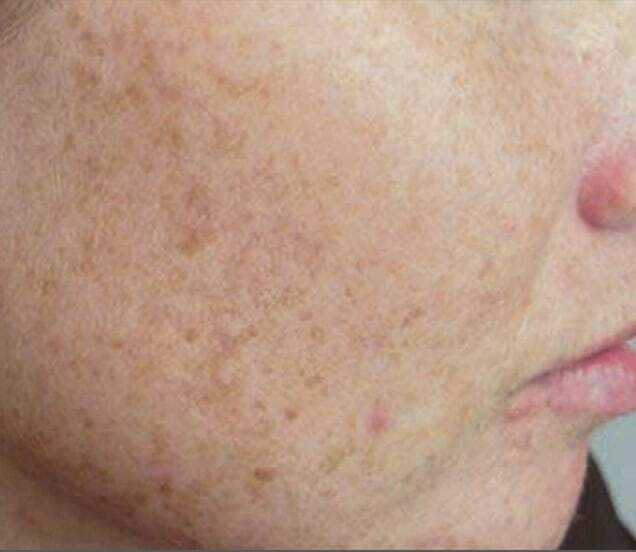 Freckles and age spots will appear darker immediately following treatment and will continue to darken over the next few days. On the face, these dark spots will slough off in approximately 7 days and on the rest of the body, these spots will slough off in 2 – 3 weeks. Some vascular lesions may disappear immediately and some may appear more red or purple for a few days following treatment. If you have larger veins, some may leak during the treatment causing bruising that can last for several weeks. HOW OFTEN DO I NEED TO COME IN FOR MY TREATMENTS? For best results we recommend spacing treatments at least a month apart. This allows your skin enough time to heal following each treatment. ARE THE RESULTS PERMANENT? While we can remove the freckles, age spots, broken capillaries and redness that currently exists on your skin, the normal aging process, continued sun exposure and progression of conditions like rosacea continue. Preventative measures like sun avoidance, proper skin and sun care, smoking cessation, etc. will prolong your results. 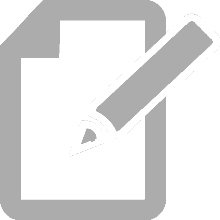 We recommend having periodic treatments to maintain your results if necessary.